Brother Marcus wasn’t actually one on my list. Although it should have been. It was a recommendation by Katy, for our rare girls day at the weekend. Which of course involved exploring too. Oh and Kim managed to find some gorgeous dining room chairs for a steal at one of the second hand shops on Essex Road. Shes up-cycling them so keep an eye out for more. Can’t wait to see the finished piece! Anyway back to the brunch spot. 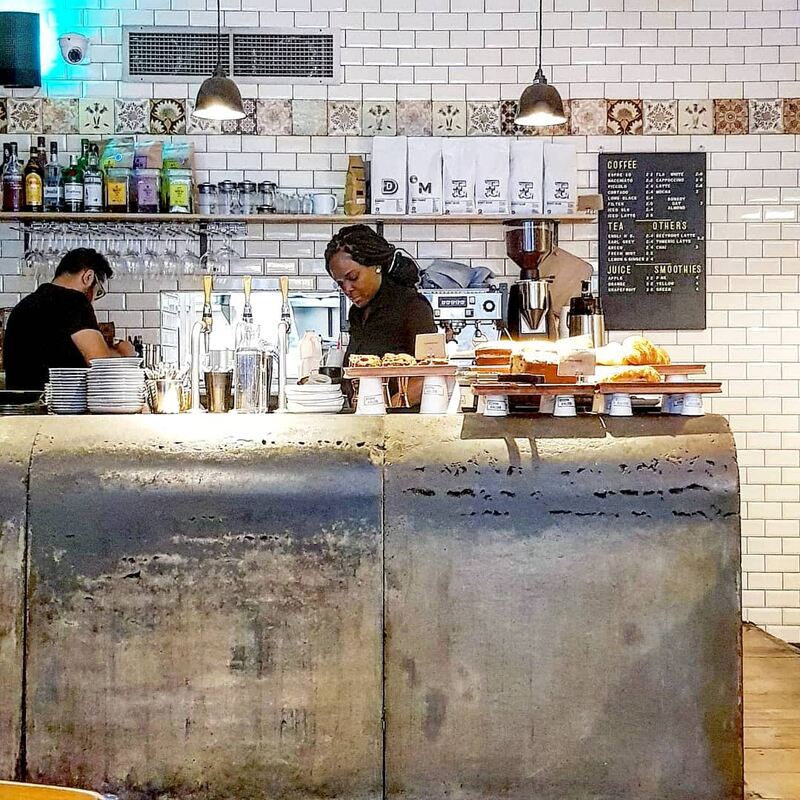 Brother Marcus is a cute little spot which can be found down Camden Passage in Angel. There’s one in Balham too! Its got a simplistic, natural feel inside, with light woods for the tables and floor, and white walls. There are a couple frames hung, but it’s all very minimalist. Very earthy. It’s pretty relaxed, bright and spacious. It definitely doesn’t feel like you’re coming off of bustling Camden Passage. There were more tables than first expected from the exterior. A number of larger tables for sharing, and smaller for couples and fours filled the space. We managed to be seated right away the Saturday we visited (about 11.30am). I quite liked that we weren’t squeezed in against someone else too, even though we were sharing a table. Ok onto the important bit…the food. 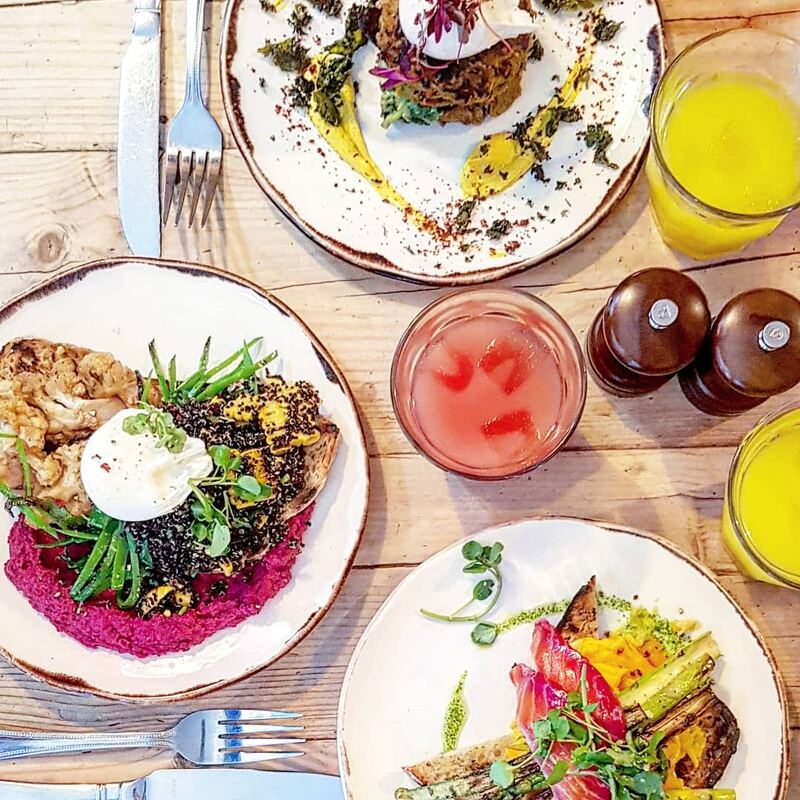 The menu has plenty of brunch options, including a fab vegan choice, and a couple of veggie options too. Stalking Instagram to help us decide, we knew they all looked good, so the pressure came down to how they tasted. I was definitely impressed by my pick, The Brother Special. 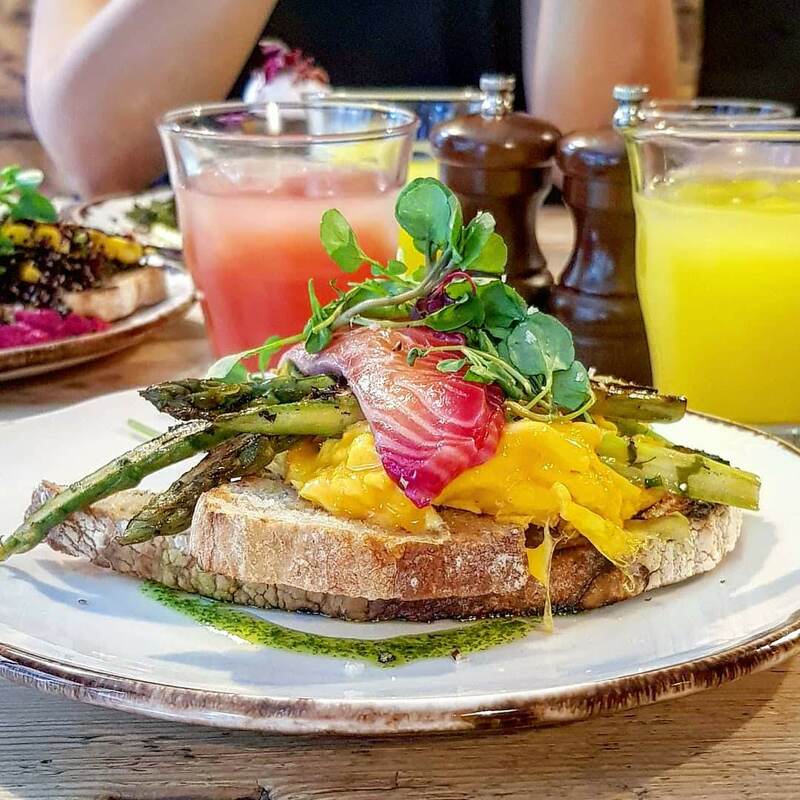 The dish consisted of deep pinky-red beetroot cured salmon, the creamiest scrambled eggs, grilled English asparagus and gremolata. 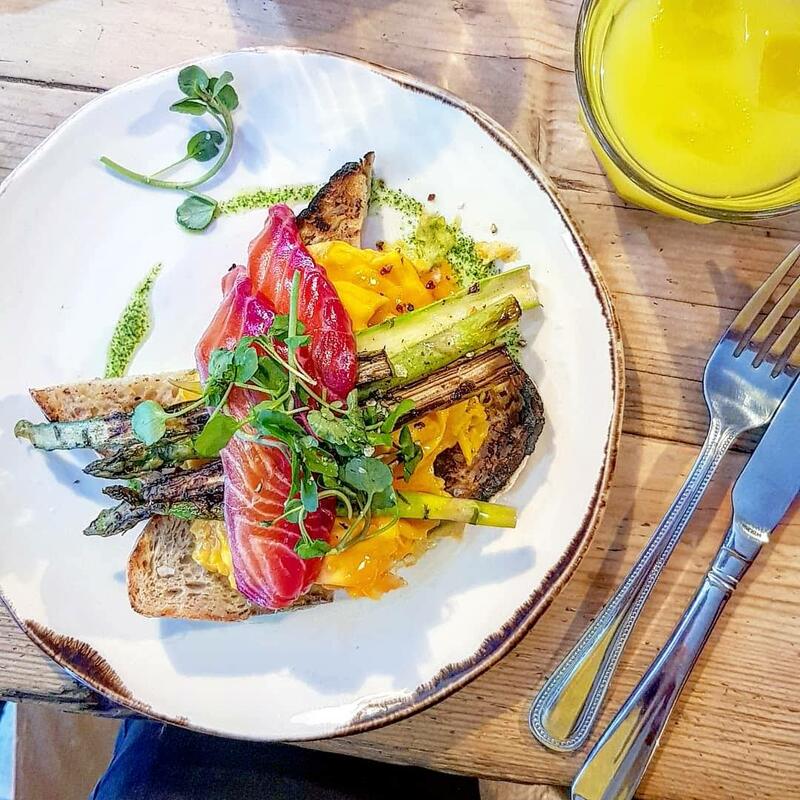 Served on lightly toasted bread, it was finished topped with watercress and tasted fresh and vibrant, with the mix of mild beetroot flavour on the cured salmon and asparagus. It was presented beautifully, but most importantly cooked and prepared beautifully too. The Yummy Mummy would have been my next choice. 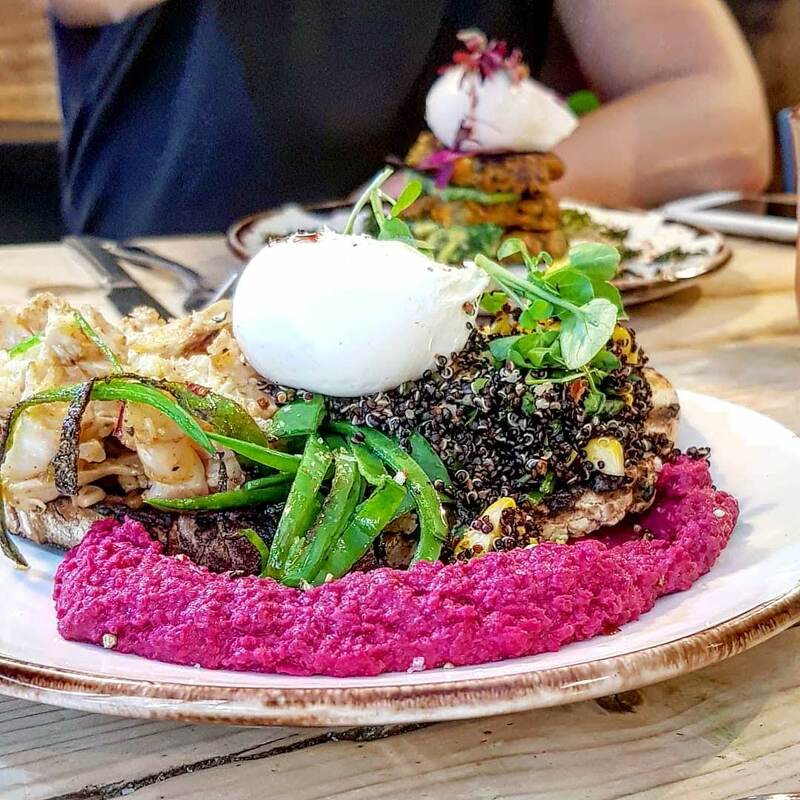 The vegan option, the dish consists of cajun cauliflower, beetroot hummus, mangetout with black quinoa and charred corn on toast. Another fantastic mix of fresh, vibrant flavours, it didn’t just look amazing. Totally plant based too. The step sister, appeared to also hit the spot. 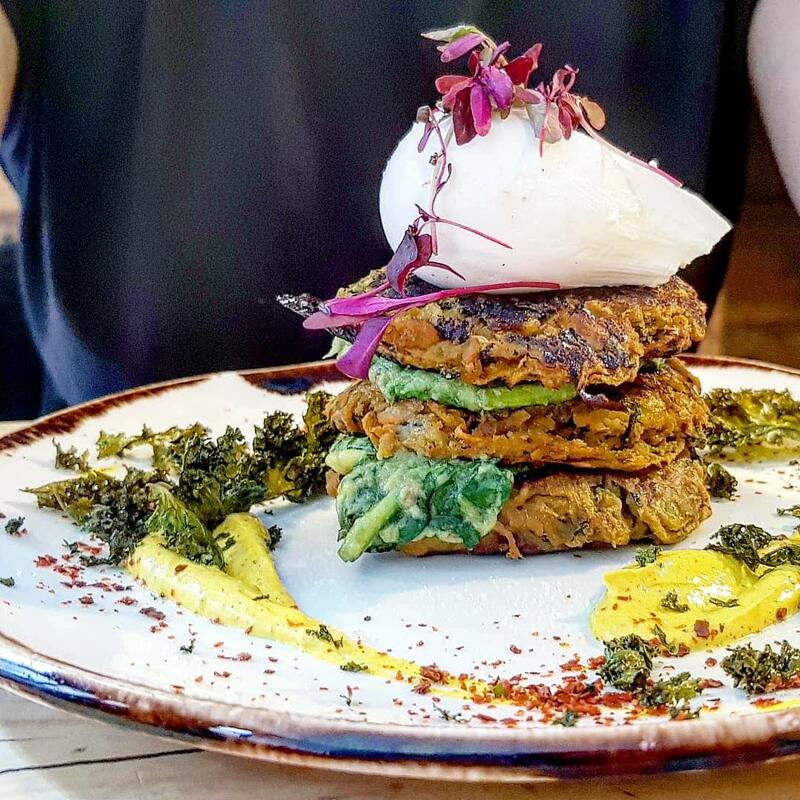 The sweet potato, courgette and feta fritters, were a hit with Katy, who often goes for the fritters on the menu – morning or night. These were served with avocado & spinach, kale, turmeric yoghurt and a runny poached egg, which provided the fresh and creamy mix of flavours and textures. 3 different brunch dishes. All went down a treat. The drinks menu features a range of options too, from cocktails to wine and beer, for those who fancy a boozier brunch. The fresh juice was zesty and refreshing. A fab choice for a soft option. In fact we all went for different juices! 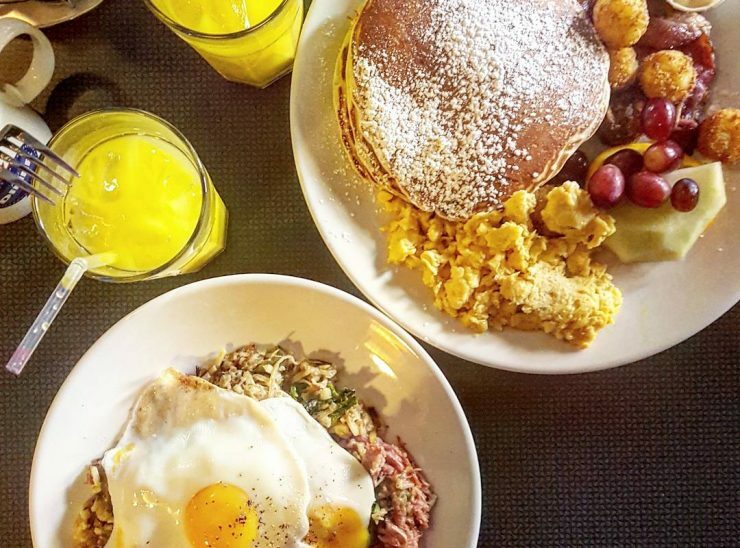 Price: Brunch dishes from £5.20 to £10.80, it’s really reasonable for brunch in London. Drinks: Whether you fancy a boozy start to the day or not, there are plenty of options. The juices are so fresh. Atmosphere: Natural, chilled, not packed in. Great spot for a weekend brunch! Wait: No wait. Seated straight way on a Saturday morning at about 11.30am – but worth the wait if there was one! All-round, I highly recommend this spot! Great date-day spot, or somewhere to catch up with the girls. What would you have picked?